Over the weekend we showed a peculiar pattern in the VIX term structure, which failed to normalize after a sharp inversion early in the month, and has since drifted further into negative territory. 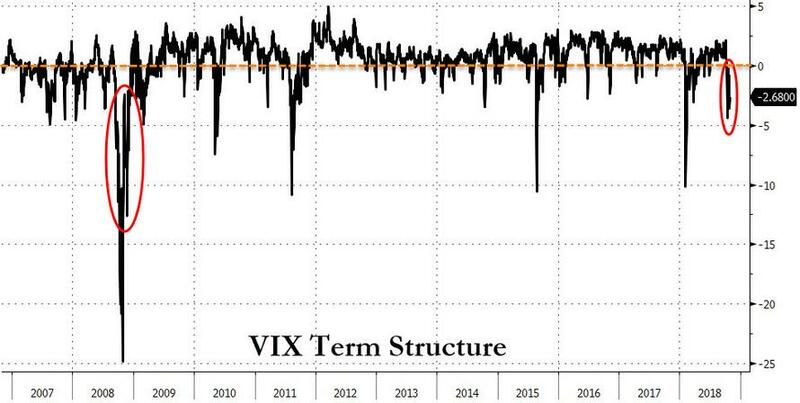 This is notable as it was the first time since the financial crisis that the VIX term structure had failed to disinvert before resuming its slide, suggesting that the market is expecting even more pain down the road. Today, Goldman's derivatives strategist Rocky Fishman makes a similar observation. 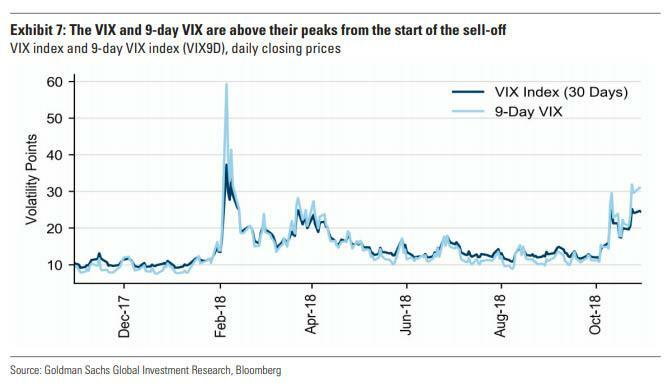 As Fishman notes, looking simply at spot VIX does not reveal anything particularly troubling: while VIX has predictably spiked during the October selloff to the highest closing VIX since February, it has been nowhere near February’s VIX peak: at 25, the VIX is just below Wednesday’s (24-Oct) highest closing level since mid-February in 2018’s second mathematical SPX tail event, "but has not come anywhere near its ETP-fueled February peak of 37 (closing, and 50 intraday)." 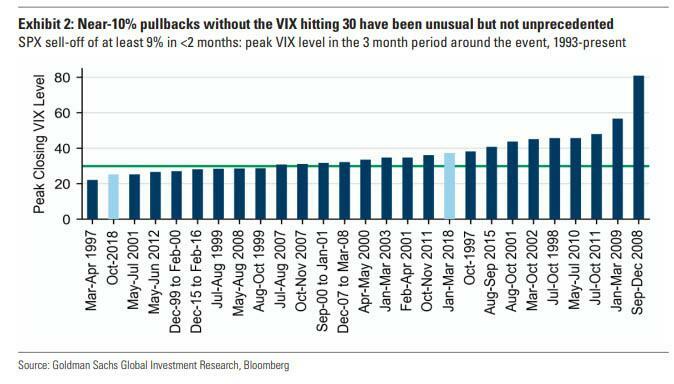 In fact, one can argue that the move in spot VIX has been relatively subdued, and as the Goldman strategist points out, 10% sell-offs without the VIX hitting 30 have been historically uncommon, but are not unprecedented. 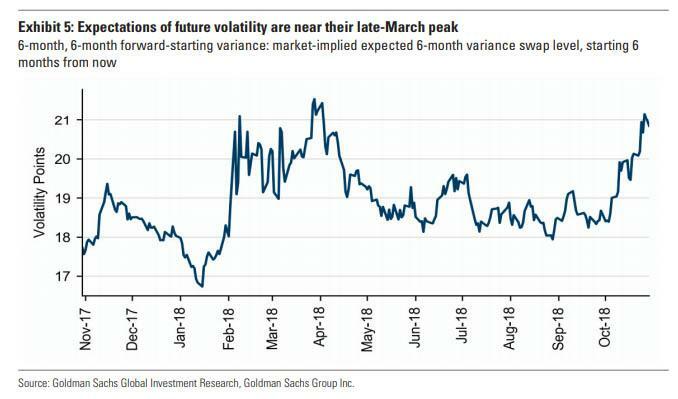 But as we noted over the weekend, and as Goldman reiterates today, the real action is not in the spot VIX but in the forwards, with Fishman observing that "some longer-dated volatility metrics have now exceeded February’s." What is particularly notable, is that the market appears to be pricing in a longer-duration high volatility period than they did in Q1 "consistent with a view that this sell-off is driven more by reduced economic growth expectations than market technicals." In realized terms, Goldman brings attention to the 140bp median daily absolute SPX return over the last three weeks which has been higher than seen over any period in Q1 (though 15-day realized volatility was higher in Feb due to the outsized impact of 5-Feb’s 4.1% selloff). The best way to see this is by looking at 3-6 month VIX futures which are now above Q1 highs: this suggests that expectations of volatility a few months into the future are now higher than they were in February. 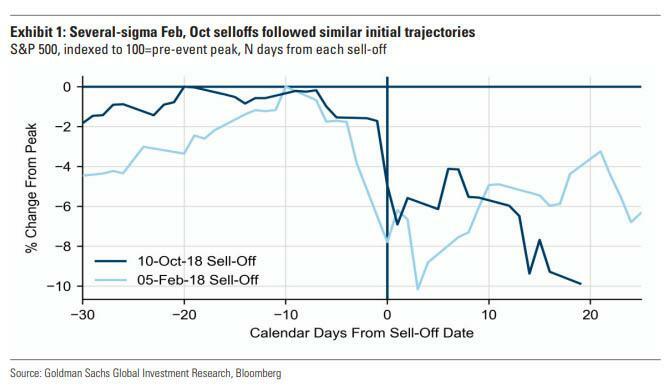 Similarly, 6-month, 6-month forward-starting SPX variance (expectation of 6M variance, 6M from now), is near its March high, as traders brace for a longer period of turmoil than they did at the start of the year. 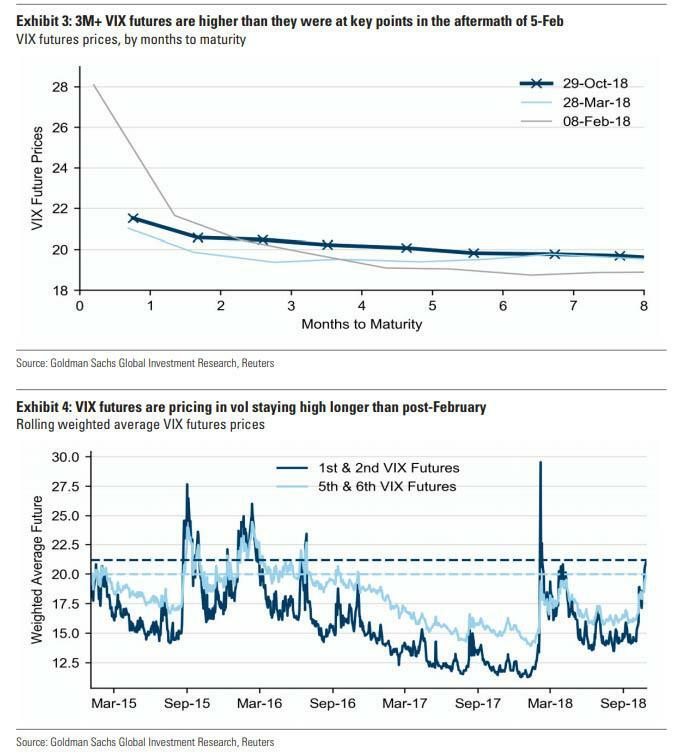 Finally, when looking at shorter-dated implied vol, Goldman points out that while it is very high, it is the result of recent market turmoil and not because of next week's US elections. Fishman points to the 9-day VIX index which is at 31, just below Wednesday’s (24-Oct) highest level since the week of 5-Feb, and notes that the index is derived from the prices of options expiring this Friday (2-Nov) and next Friday (9-Nov); the pre-elections 2-Nov has a much higher at-the-money implied vol (31) than the post-elections expiration (27), "implying more fear over a continuation of recent volatility than an event-driven shock next week." 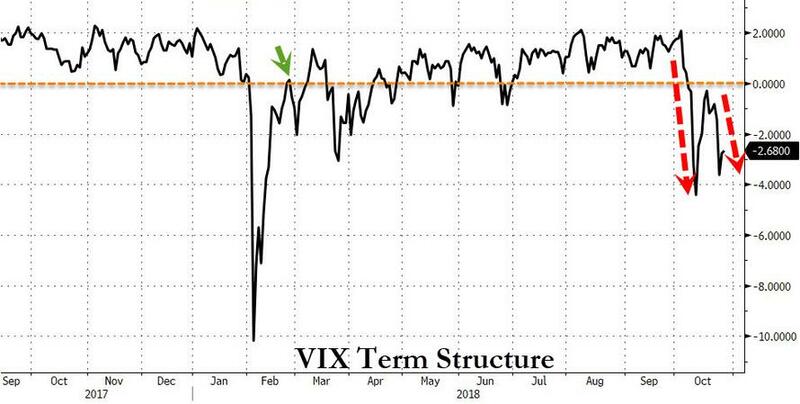 To summarize: while the spot VIX may not indicate a panic, and remains well below the record high levels hit during the February selloff, which was largely a function of inverse VIX ETFs blowing up and forced to bid VIX to stratospheric levels, an even which was promptly cleared out once several inverse VIX providers blew up, what is more concerning this time is that the market is now hinting that the slow grind higher in volatility could be more pernicious as it extends for far longer than the market turmoil experienced at the start of the year. And with the S&P already in de fact correction, one wonders if the long-overdue bear market isn't finally on deck.